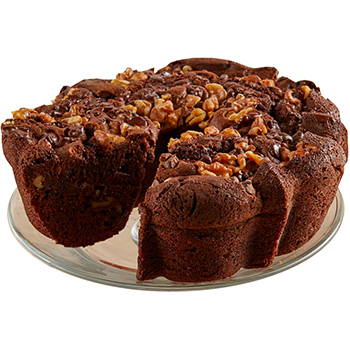 This abundant decadent chocolate cake with walnuts will become a sweet surprise for you favorite chocolate lover! Moist and fresh it comes in a beautiful gift box and makes a perfect gift for almost any occasion. Say Happy Birthday, Get Well, Thank You with our Italian Style Chocolate Coffee Cake! This product contains egg, milk, wheat and soy ingredients, and was produced on equipment that processes peanuts, almonds, hazelnuts, pecans, walnuts. PLEASE BE ADVISED the cake must be ordered 12 to 14 days in advance to ensure timely delivery. In order to guarantee freshness, delivery of this item is not recommended on Mondays. Please contact customer service if you have further questions.